In the early days of public healthcare in America sick and hurting people were cared for close to home in small hospitals. Doctors, community leaders, churches or charitable organizations often started these hospitals. Many small communities were able to support their own hospitals. Franklin County communities mirrored the nation in how they cared for their sick and infirm residents. The opening of the county's first hospital in 1908 at Zeigler, Illinois was a true milestone. The 22-bed facility served the southern region of the county for many years. However, it is no longer in service. In 1914 the UMWA (United Mine Workers of America) Hospital was opened in West Frankfort. With 99 beds it served the residents of the West Frankfort until the year 2000. From 1919 to 1947 the residents of Christopher were served by the Dr. Willis Hospital. After a tragic fire the Willis Hospital closed; it was replaced by Miner's Hospital located on South Carbon Street. The first official hospital in Benton was the Moore Hospital, which opened its doors in 1920. It was located on the sixth floor of the Wood Building on Benton's Public Square. In 1926 Dr. J. B. Moore constructed a new hospital facility on North Main Street. It remained operational until the late 1950's and served as a nursing home before demolition. In the early 1950's the residents of 11 out of 12 townships in Franklin County voted to create a hospital district. In 1955 the Franklin Hospital began operation with 115 beds. Over the years as healthcare has changed so, too, has the Franklin Hospital. Now a 16-bed Critical Access Hospital, we have taken great strides to improve the quality of healthcare services offered to the small rural communities that we serve. 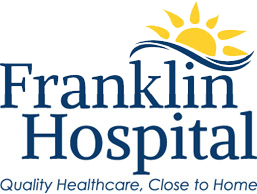 Franklin Hospital partners with SSM Health Good Samaritan Hospital in nearby Mt. Vernon, Illinois to offer county residents access to their network of physician specialists. Additionally, we have been the recipient of several state and federal telemedicine grants which have allowed us to upgrade our information technology systems. Now connected by high speed internet lines to the world wide web our staff physicians are able to consult with other highly trained and expert physicians miles away, in real time, for the healthcare benefit of our patients. Through the dedication of the hospital's board of directors, administrative team and the employees of Franklin Hospital the residents of Franklin County have quality healthcare - right here at home.